The proper symbol of medicine is called a Rod of Asclepius, and consists of a single snake wrapped around a central pole. 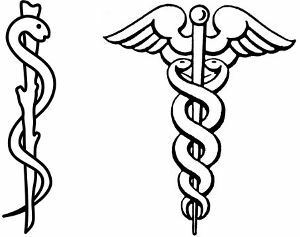 It is not to be confused with the Caduceus, which consists of two snakes wrapped around a winged pole, and is associated with the god Hermes. Rod of Asclepius and Caduceus. Pinterest. sometimes the shedding of skin and renewal is emphasized as symbolizing rejuvenation, while other assessments center on the serpent as a symbol that unites and expresses the dual nature of the work of the physician, who deals with life and death, sickness and health. The ambiguity of the serpent as a symbol, and the contradictions it is thought to represent, reflect the ambiguity of the use of drugs, which can help or harm, as reflected in the meaning of the term pharmakon, which meant “drug”, “medicine”, and “poison” in ancient Greek. Products deriving from the bodies of snakes were known to have medicinal properties in ancient times, and in ancient Greece, at least some were aware that snake venom that might be fatal if it entered the bloodstream could often be imbibed. Snake venom appears to have been ‘prescribed’ in some cases as a form of therapy. Medical bodies that are on the ball will identify themselves with a Rod of Asclepius. 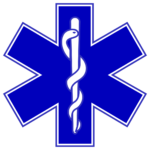 Left to right: the Emergency Services’ Star of Life, the coat of arms of Geisel School of Medicine at Dartmouth College, and the logo of the American Medical Association, all from Wikipedia. The Caduceus, by contrast, comes from the Greek kērukeion, and simply means herald’s staff. Since Hermes was the herald of the gods, he is often depicted with a staff of some sort, usually with something wound around it; this has been formalized as two snakes, and the wings match the wings on Hermes’s helmet and shoes. The Caduceus, therefore, represents items in Hermes’s wheelhouse, chiefly commerce. Coat of arms of Jyväskylä, Finland and of Metropolitan Toronto (1954-98) featuring Caduceuses. From Wikipedia and the Online Register of Arms, Flags, and Badges of Canada. Or rather, the Caduceus ought to represent commerce. By the same process that saw methodology replace method, or discipline replace field, a device with two snakes (and two wings!) was seen as somehow grander than a device with one. See the Wikipedia entry on the Caduceus as a symbol of medicine. Apparently the US Army was the chief culprit here. Daniel P. Sulmasy said that “It is hard to trust a profession that cannot even get its symbols straight,” but others have noted the ironic appropriateness of the American medical profession representing itself with a symbol of commerce. From Cory Schantz, an interesting article on The Gospel Coalition, emphasizing that Saul did not “change his name” to Paul upon becoming a Christian, but was always known by both names – “Saul” being the Hebrew form of it, and “Paul” the Greek. Tu es Paulus et super hoc paulum adificabit ecclesiam meam. That is, “you are Paul, and on this little bit I will build my church” – something like the mustard seed in Matthew 13. 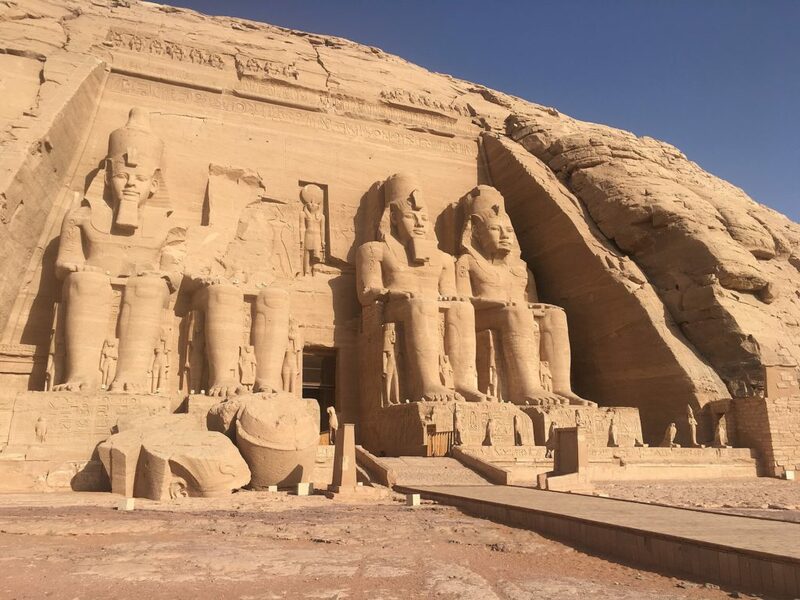 This week students in History 111 read a number of Biblical passages to illustrate ancient Hebrew history. Of course, if we were all proper scholars, we would be reading them in the original Hebrew, but no one (including me) would be able to handle that, so we are reduced to using a translation into a “language understood by the people,” as Protestant Reformers recommended. But what translation? You can translate texts in more than one way, of course, and with something as important as the Bible, translation becomes a serious issue. Martin Luther himself, I understand, translated the Bible in certain ways in order to justify his own theology – and one of the reasons why he dropped several books of the Old Testament, bringing the Bible into conformity with Jewish usage, is because such books as Maccabees, Judith, Tobit, and Esdras did not support his interpretation of Christianity (thus their current designation as “apocryphal”). And if prose like this sounded grand back in the seventeenth century, how much more grand does it sound now! This is what people love about it – so much so that there exists a King James Only movement, whose adherents hold that the Authorized Version is the ne plus ultra of English translations – that it is even divinely inspired. Somehow it exists above and beyond the politics of the Church of England in 1611. Now, I have no problem with people who prefer a majestic bible! And given the influence of the KJB on the history of the English language, everyone should read it anyway for the sake of cultural literacy. But given that in HIS 111 we’re reading the bible, not for spiritual edification, nor as a primary source for the seventeenth century, but to discover something about the ancient Hebrews, we should probably try to avoid elevated prose, in favor of current American Standard English, to help us understand the meaning of the original text as much as possible. I see on the back the NIV was used for these translations. The NIV has removed 40 verses and over 64,000 words. Verses such as Matthew 18:11 – “For the Son of man is come to save that which was lost.” Mark 11:26 – “But if ye do not forgive, neither will your Father which is in heaven forgive your trespasses.” So the question is, why was this version decided upon when so much was taken out? I confess that I was unaware of this issue, and I assure my readers that censorship was not my intention! However, I cannot imagine the translators of the NIV acting as a sort of sinister cabal, removing verses at will in order to further a certain agenda. Instead, they were simply using the best original manuscripts they could come up with. Unfortunately, the Bible, in its early days, was rather like a Wikipedia article, which people felt free to edit according to their taste. 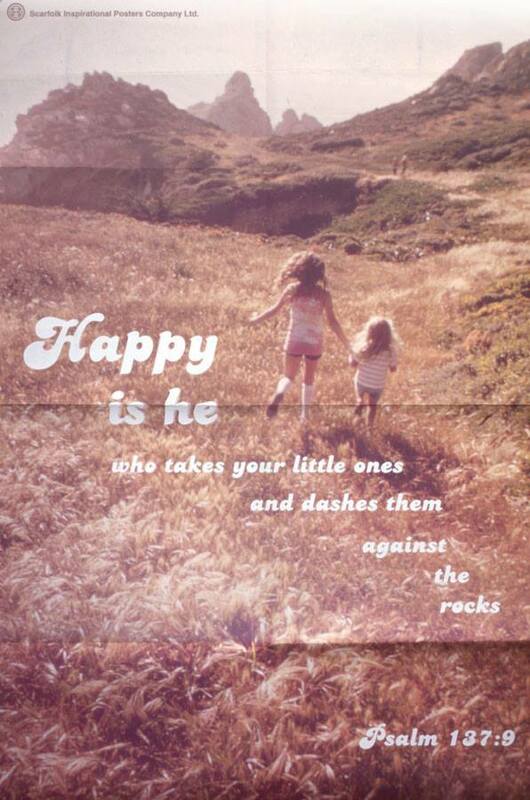 (Forget tendentious translation, this is monkeying with the text itself! Nowadays there are taboos against this sort of thing.) This then raises the question, what did the original text look like? Can we even speak of such a thing – and if so, how shall we go about establishing it? In the sixteenth century, the Dutch humanist Desiderius Erasmus set himself the task of publishing a Greek New Testament, to which end he collected as many manuscripts of it as he could. Perhaps unsurprisingly, not all of these manuscripts agreed with each other, leaving Erasmus to make a few judgment calls. This effort has been ongoing since his time – and as more and more biblical manuscripts are uncovered, and our linguistic knowledge has grown more sophisticated, our sense of the original Greek text has sharpened – which means, unfortunately, that what we now realize are later textual additions must be excised, no matter how edifying we might find their sentiments. The Hebrew Masoretic Text (“𝕸”) and the Nestle-Aland Koine Greek New Testament, used by the translators of the NIV, are simply more accurate than the Hebrew and Greek sources that were available to the translators of the KJB (who themselves were constantly comparing their efforts to the Bishops’ Bible of 1602, i.e. the KJB isn’t entirely a fresh translation). As for the NIV’s lack of Matthew 18:11: Bible Gateway says, in a footnote, “Some manuscripts include here the words of Luke 19:10.” For Mark 11:26, it says “Some manuscripts include here words similar to Matt. 6:15.” So it seems that the compilers are willing to acknowledge the editorial decisions they’ve made – and these particular verses appear elsewhere in the bible anyway.